This deep-cleansing benzoyl peroxide shampoo contains 2.5 percent benzoyl peroxide, which helps alleviate conditions associated with seborrhea dermatitis, canine and feline acne and other conditions where a keratolytic vehicle may be beneficial. Excellent degreaser for problem coats. Aids in the opening and flushing of hair follicles. Contains natural moisturizers to promote hydration of the coat and skin. Safe for use on dogs, cats, puppies and kittens. Rubber gloves are recommended when using Benzoyl Peroxide. Avoid contact with eyes or mucous membranes. Keep out of reach of children. May be used daily or as directed by a veterinarian. If irritation develops, discontinue use and bathe pet with Davis Hypoallergenic tearless shampoo. Ingredients are benzoyl peroxide, natural coconut based lathering agent, ammonium Lauretha sulfate with ethanol, propylene glycol, preservative, proprietary polymer, and purified water. Directions for use - Wet pet's coat thoroughly with warm water. Apply shampoo to head and ears, then lather. Be careful not to get shampoo into eyes. Repeat procedure with neck, chest, middle and hind quarters, finishing legs last. Allow pet to stand for 5 to 10 minutes. Rinse thoroughly. Available in 12-ounce size. Measures 7-4/5-inch length by 2-2/7-inch width by 2-2/7-inch height. Burt’s Bees Hypoallergenic Cat Shampoo is made with some of nature’s finest ingredients for your peace of mind and a happy cat. Burt’s Bees uses all-natural ingredients because we wanted a powerful but safe way to bathe your cat’s sensitive skin without any harmful chemicals or irritants. Tap into nature’s power with this Hypoallergenic Cat Shampoo made with naturally hypoallergenic shea butter for deep moisturizing and honey to give fur a super shine. 99.8% natural. Best Hypoallergenic Cat Shampoo Cleans, Softens Dry Skin, and Conditions Skin and Fur. Mild formula is cruelty free, sulfate free, pH balanced for cats. No colorants, No essential oils, and no fragrances. Made with the highest quality all natural ingredients. Keep your dog's skin and coat healthy and free of sores and hot spots with a safe, natural and powerful shampoo designed for pets. Just like us, our dogs' skin and coats are their protection from infection, dehydration, bug bites, and even sun damage. That's why it's important to keep their skin moisturized and their coat clean and healthy with Arava Intensive Bio-Care Dog Shampoo. Better than oatmeal shampoos and oils that only handle a single problem, our nano-emulsion system offers multi-functional skin and coat support without removing the natural protects your pet's skin and coat. You've no doubt seen your dog scratch their ears or lick a sore spot on their leg and thought, "what can I do to help them?" That's because as a responsible pet owner, you want to give them the very best. Our powerful, natural, medicated formula helps reduce skin irritations caused by bug bites, hot spots, dryness and more, while also improving hair volume, shine and manageability. Better yet, it can start working after a single bath. If you're ready to improve your pet's skin and coat, give them the very best pet medicated shampoo and conditioner available; give them Arava Intensive Bio-Care Dog Shampoo. For Best Results: Leave shampoo on your pet's body for a least 8 minutes before rinsing. Follow up with Itchless & Hot Spots Relief Therapy Conditioner or Itchless & Hot Spots Relief Therapy Black Mud for advanced relief. Click 'Add to Cart' now to get a powerful medicated shampoo for your dog or puppy and improve their skin and coats. • DEAD SEA MINERALS - Formulated with premium Dead Sea minerals, Arava Therapeutic shampoo is perfect for treating skin problems and irritations including hot spots, infections and inflammation. Contains 28 natural ingredients. • DEEP, POWERFUL CLEANSE- The Arava Bio-Care formula is a pet-friendly formula that gently cleanse deep within your dog's undercoat to enrich the follicles, making the fur more beautiful, shiny and without dandruff. Perfect for dogs with dry skin! 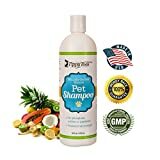 • REDUCES SKIN INFECTIONS - Designed to specifically treat dermatological conditions, this pet medicated shampoo helps HEAL hot spots, scrapes and abrasions, mange, ringworm, dandruff, seborrhea and keeps skin folds cleaner and healthier. 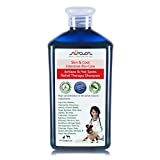 • NATURAL, ACTIVE INGREDIENTS - Arava Pet shampoo contains 28 active ingredients including potent antibacterial, antifungal and anti yeast botanical oils that help heal most of the skin bacteria and fungal that indoor and outdoor pets can pick up. 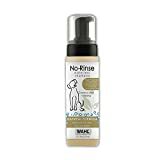 • LIGHT, FRESH SCENT - A silky, moisturizing formula that's safe for dogs and puppies alike, it offers a much smoother comforting feel than other pet shampoos with the top performance of a powerful medicated shampoo. Your pet will have the quality of dead sea therapeutic shampoos, and you will enjoy washing it. Nice odor of essential oils makes it the best shampoo for stinky dogs. Order now and get a 30 DAYS MONEY BACK GUARANTEE. 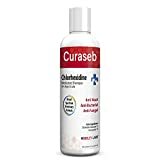 Curaseb is a Veterinary Recommended Chlorhexidine Shampoo that is Antifungal, Antibacterial and Anti-Yeast. Our Broad Spectrum Formula is effective against a broad range of skin issues like Ringworm, Pyoderma, Skin Allergies and More. Compare Us to Other Name Brand Shampoos! We use the Same Active Ingredients As Our Competitors, But At a Lower Price! Why Pay More For a Name? We Are So Confident in Your Satisfaction with Our Product That If You Don't Absolutely Love the Results You Get, Return it for a Full Refund. Even if the Bottle is Empty. There is No Risk; You have Nothing to Lose. We always recommend that you take your pet to a licensed veterinarian to diagnosis any medical condition your pet might have.This product should be used with guidance from your veterinarian. *This statement in this listing has not been evaluated by the Food and Drug Administration. This product is not intended to diagnose, treat, cure or prevent any disease. All content found in this listing including: text, images, audio, or other formats were created for informational purposes only. The Content is not intended to be a substitute for professional medical advice, diagnosis, or treatment. Always seek the advice of your veterinarian or other qualified health provider with any questions you may have regarding a medical condition. Never disregard professional medical advice or delay in seeking it because of something you have read on this product listing. Formulated with plant based cleansers Oatmeal extract efficiently soothes damaged skin. 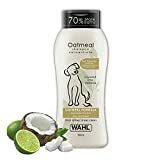 Coconut Lime Verbena fragrance is designed to give your pet a clean, fresh smell without bathing Plant based cleansers make Wahl’s Shampoo the choice for owners who want to avoid harsh chemicals for both their dog and themselves. Our Shampoo is PEG-80 Free, Alcohol Free, and Paraben Free. Ever bought expensive Doggie Shampoo and been dissapointed with dull frizzy hair afterwards ? We know you love your doggy and want him or her to look and smell GREAT that's why we have developed our High Grade 5 in 1 Dog Shampoo. It replenishes the skin's natural moisture and leaves a show-pet shine with each use. It is ultra-mild and gentle on your pet, but is tough on dirt and grime that our pooches seem to constantly collect ! ✳️ A GREAT SMELLING YUMMY Tropical Scent with Coconut so you can say GOODBYE to that strange damp dog smell and will want to hug your silk smooth dog all day long. ✳️ WE FORMULATED OUR PREMIUM DOGS WASH to be Easy to use and Easy to rinse out. With just the right amount of lather so you won't lose your pooch under a mountain of foam that runs into the eyes. Wahl's Oatmeal Shampoo contains oatmeal, coconut, lime, aloe and lemon verbena to soothe dry, itching, irritated skin. Healthy skin means a healthy coat and less shedding. The gentle formula has a rich lather and easy rinse to make bath time an easier time for both you and your dog. Plant derived ingredients make Wahl's Shampoo the choice for owners who want to avoid harsh chemicals for both their dog and themselves. Our Shampoo is PEG-80 Free.